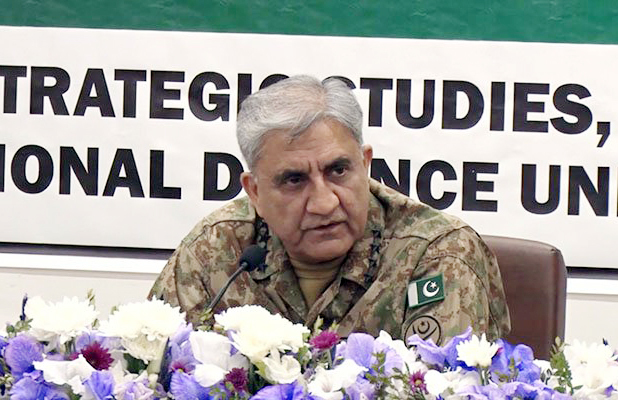 ISLAMABAD, Mar 26 (APP):Chief of Army Staff (COAS), General Qamar Javed Bajwa, Tuesday visited National Defence University (NDU), Islamabad and addressed the participants of the 4th Pakistan-UK stabilization conference. According to Inter Services Public Relation (ISPR), during interaction with participants, COAS focused on internal and external security situation of the country and his vision of an enduring peace within Pakistan and the region. COAS also highlighted prospects of Geo-political environment, security challenges and China Pakistan Economic Corridor (CPEC) towards economic development of the region. COAS reiterated that Pakistan was focused and determined to achieve “a stable, peaceful and normalized Pakistan”. Later on, Lieutenant General Patrick Sanders, Commander UK Field Army called on COAS at National Defence University. Earlier on arrival, COAS was received by Lieutenant General Aamer Riaz, President National Defence University.